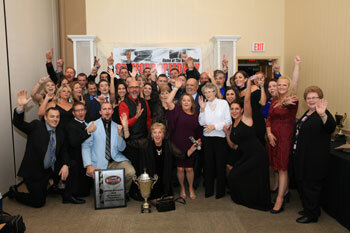 (Stafford Springs, CT)—Stafford Motor Speedway welcomed a guest list of nearly 450 people consisting of teams, drivers, sponsors, and employees this past Friday night, November 16 at Maneely’s in South Windsor to officially honor Ronnie Williams, Tom Fearn, Marcello Rufrano, Jeremy Lavoie, & George Bessette, Jr. as the 2018 Stafford Motor Speedway NASCAR Whelen All-American Series track champions. 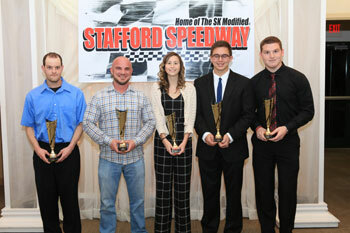 With Stafford Motor Speedway broadcaster Matt Buckler and MRN Radio’s Kyle Rickey serving as the Masters of Ceremony, the 49th annual Stafford Motor Speedway NASCAR Champions Awards Ceremony recognized the top-10 points finishers from the SK Modified®, Late Model, SK Light, Limited Late Model, and Street Stock divisions as well as honoring the track champions. Special awards that were presented during the evening’s festivities were Most Popular Driver Awards, NAPA Auto Parts Parts Rookie of the Year, R.A.D. Automachine Rookie of the Year, and the UNOH Youth Achievement Award. Ronnie Williams and the #50 Les’s Auto Center / Empower Financial team were the perfect combination of consistent and dominant in their run to the 2018 SK Modified® championship. After Keith Rocco won the first four races of the season, Williams found himself 44 points behind. 13 top-5 finishes in the first 14 races of the season allowed Williams to slowly chip away at his points deficit and he took the point lead for the first time following his victory in the NAPA SK 5k on June 29. Williams would lead the points standings for the remainder of the season and he clinched the title with one race to go. For the season, Williams and the #50 team posted 4 wins, 14 top-5 and 17 top-10 finishes for an average finish of 5.8. The 2018 Late Model season at Stafford saw Tom Fearn and the #92 King Ward Coach Lines team have things all their way. Fearn scored a Stafford Speedway record 12 wins this season and he finished on the podium in 19 of his 21 starts this season. Fearn’s dominance this season also saw him surpass Ryan Posocco for the most career Late Model feature wins at Stafford with 48 and counting. Fearn’s season numbers read 12 wins, 19 top-5, and 19 top-10 finishes with a miniscule average finish of 2.4. 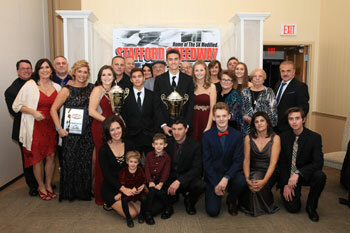 The race for the 2018 SK Light championship saw one of the tightest championship races in Stafford’s long and storied history with Marcello Rufrano and Bryan Narducci vying for the title. The 2 friendly rivals from their days in the Monday Night Wild Thing Kart Series at Stafford were neck and neck for much of the season with both driver taking turns leading the standings. Just when it looked like Narducci had one hand on the trophy, a pair of 15th place finishes in the four races leading into the season ending NAPA Fall Final allowed Rufrano to eliminate his gap to Narducci and they were tied heading into the final race. The two championship protagonists were dueling for the race lead late in the final feature event of the season when they touched wheels and both cars ended up in the turn 3 wall. With Rufrano being ahead by a nose on the last completed green flag lap, he won the championship by a 2 point margin over Narducci. For the season, Rufrano and the #88 Wheeler’s Auto Service, Inc. team scored 6 wins, 11 top-5, and 16 top-10 finishes for an average finish of 6.4. Much like Tom Fearn in the Late Model division, Jeremy Lavoie and the #6 Aspen Hill Farm team had things all their own way in their run to the 2018 Limited Late Model championship. Lavoie recorded two three-race winning streaks during the season and he led all drivers with 8 wins on the season. The season began under the worst possible circumstances for Lavoie as a mechanical issue relegated him to a last place finish in the season opening NAPA Spring Sizzler feature event. Lavoie slowly dug himself out of that hole and once he took the point lead for the first time he slowly extended his advantage over his closest pursuers and he clinched the title with one race left on the schedule. For the season, Lavoie posted 8 wins, 16 top-5, and 20 top-10 finsihes for an average finish of 3.3. After winning Rookie of the Year honors and finishing as the championship runner up in 2017, George Bessette, Jr. returned to Stafford in 2018 with his eyes on winning the championship. Bessette and the #39 Lasco Roofing and Sheet Metal team took turns swapping the point lead with Meghan Fuller and Brandon Michael early in the season, but the second half of the season is where Bessette and his crew put the hammer down. In the final 12 races of the season, Bessette scored 11 podium finishes, including 4 of his 5 wins to pull away from his closest pursuers and lay claim to the championship. For the season, Bessette recorded 5 wins, 17 top-5, and 19 top-10 finishes for an average finish of 4.0. 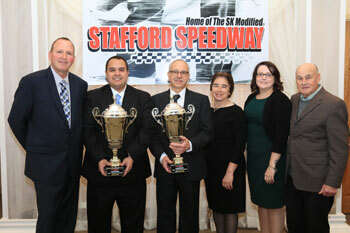 The NAPA Auto Parts Rookie of the Year awards were presented to David Arute from the SK Modified® division and Al Saunders from the Late Model division. Taking home R.A.D. 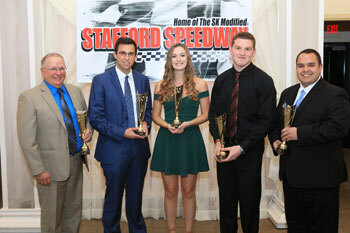 Automachine Rookie of the Year honors were Bryan Narducci in the SK Light division, Steven Midford in the Limited Late Model division, and Meghan Fuller in the Street Stock division. The NAPA Auto Parts rookie awards will be worth a $1,000 gift card redeemable at participating NAPA Stores to Arute and Saunders, with Narducci, Midford, and Fuller each winning a $500 bonus from R.A.D. Automachine that will be paid out in $100.00 weekly increments to each driver as they attend events during the 2019 season. 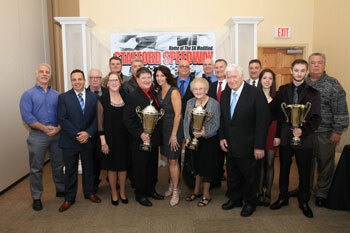 The winners of the Most Popular Driver Awards were Dan Avery in the SK Modified® division, Paul Arute in the Late Model division, Bryan Narducci from the SK Light division, Jeremy Lavoie from the Limited Late Model division, and Nicole Chambrello in the Street Stock division. The Most Popular Driver Awards are voted on by the fans who attend Stafford Motor Speedway race events and fill out the ballots found in the track’s weekly PitStopper Magazine combined with an online vote. 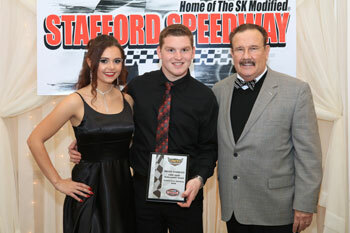 The UNOH Youth Achievement award was won by SK Light Modified driver Bryan Narducci. 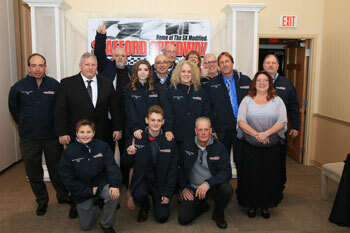 The UNOH Youth Achievement Award is a program that is open to all drivers at Stafford between the ages of 14-17. The eligible driver who scored the most track points from their best 14 finishes this season won a $500 cash award from UNOH as well as a $500 scholarship award from UNOH. Marcello Rufrano was the national UNOH Youth Achievement Award winner and he will be honored at the NASCAR Whelen All-American Series banquet in Charlotte next month. For more information, contact the Stafford Motor Speedway’s track office at (860) 684-2783 or visit us on the web at www.staffordspeedway.com.